I learned most of what I know about writing from writing short stories. They’re a great place to practise the art. They are also a fine means by which to revisit a character or a world, illuminating a corner of the original tale that perhaps deserves more attention. In addition they can be used to look back over the years, allowing us to see how our heroes and villains … well mainly villains in the case of the Broken Empire if we’re honest … came to be where we found them and what shaped them along the way. The stories in the Road Brothers anthology were written over the space of a few years, mostly for other projects. As an author you get asked to contribute to a lot of anthologies, but you’re asked because of who you are, and what they really want is a short story connected to your stuff. Since many of the ones I’ve contributed to have been for charity I tend to oblige, which left me with a collection of Broken Empire tales on my hands. Road Brothers is the basket in which I’ve gathered them up to save a lengthy hunt for the original sources. Jorg was always a very focused young man and that focus was mainly on himself, what he wanted, and how to get it. 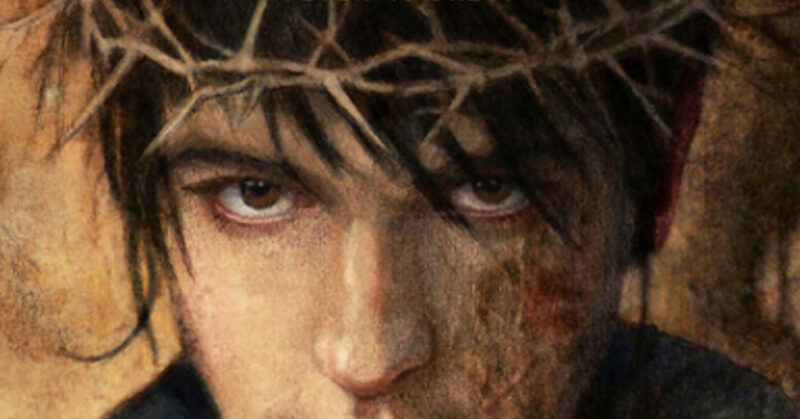 This and the fact that events in the Broken Empire trilogy are viewed almost entirely through his eyes mean that the characters who surround him, primarily his road brothers, don’t get an awful lot of attention. We don’t learn much about their ambitions, motivations, or origins. Many of them are lucky to get a pithy one-liner between chapters. It’s the nature of the tale being told, but it does leave a hankering to know just a bit more about Red Kent, about Makin, the Nuban and company. Even Brother Rike. In life, every face we glimpse in passing has a rich inner life behind it and innumerable roots branching away into the past. Road Brothers doesn’t offer you the life story of each of Jorg’s companions, just another window to glance through, but it does give us a chance to spend a little more time in their company and see them in their own right. And of course, there’s more time with Jorg, the star of three of the tales and present in several others. I enjoyed spending some more time with him! The stories in the collection offer a mix of murder, mayhem, pathos, and philosophy, and stand on their own without the need to have read the books that inspired them. I hope readers will enjoy dipping into the lives of Jorg and his brothers one more time. It was a grand tale and I was sorry to leave it behind. 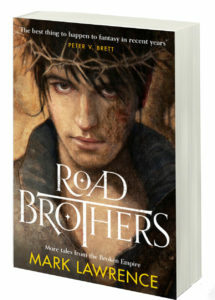 Road Brothers by Mark Lawrence is available now! This entry was posted in Fantasy, Guest Post and tagged Epic Fantasy, fantasy, Mark Lawrence, Road Brothers, short stories, The Broken Empire. Bookmark the permalink. 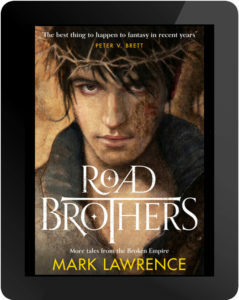 "Mark Lawrence: Revisiting The Broken Empire in Road Brothers"